The Palestinian Prisoners’ Society (PPS) has reported that Israeli soldiers abducted, late on Monday at night and on Tuesday at dawn, eleven Palestinians from their homes, in several parts of the occupied West Bank. The Israeli army said its soldiers located three weapons in an area in Nablus, in northern West bank, and claimed that the guns were used to shoot at a vehicle, transporting security guards working in Ariel colony. 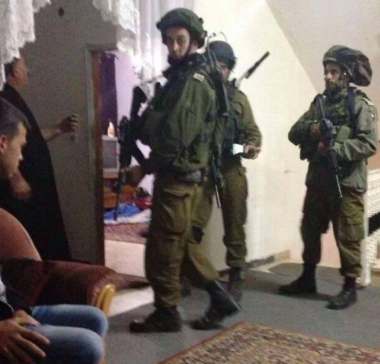 The soldiers also abducted Khaled Shareeda, during searches of homes and property in Nablus. Also in Nablus, illegal Israeli colonialist settlers uprooted more than 33 Palestinian olive trees, owned by Castro Mahmoud Qadous, and located on his orchard near Yitzhar colony. The PPS office in Bethlehem, south of occupied Jerusalem, has reported that the soldiers invaded and searched homes in the al-Khader town, and abducted Ahmad Yousef Mousa, 22, in addition to Jouda Mohammad Sbeih, 17. In Qalqilia, in northern West Bank, the soldiers abducted Mahmoud Daoud, 17, and Mahmoud Barham, 17. In Jenin, also in northern West Bank, the soldiers searched many homes and abducted a young man, identified as Mohammad Adnan ‘Aabed. In Kobar village, north of the central West Bank city of Ramallah, the soldiers abducted Hotheifa Lutfi Barghouthi. In occupied Jerusalem, the soldiers abducted Mohammad Hussein Matar, in addition to Ahmad Abed Abu Ghannam, 17. In Hebron, in southern West Bank, the soldiers abducted Odai al-‘Awawda, from his home, and installed many roadblocks in the governorate. Also in Hebron, an Israeli colonialist settler attacked a Palestinian, identified as Ahmad Hashem al-‘Azza, near his home in the Shuhada Street, causing various cuts and bruises, especially to his head. Al-Azza, a member of a local civilian neighborhood guards committee, said that Israeli soldiers witnessed the assault but failed to act. The committee was formed by the locals after Israel removed the observers of the Temporary International Presence in Hebron (TIPH), from the city, an issue that encouraged the illegal colonists to escalate their attacks against the Palestinians.